Drum able to spin 360° to mix up items prior to drawing! This raffle barrel is a great way to make promotions exciting at retail stores, special events, office raffles, and charity events. The large acrylic drum is 310mm long, easily fitting on a table whilst also still being an attractive draw to visits art your event. 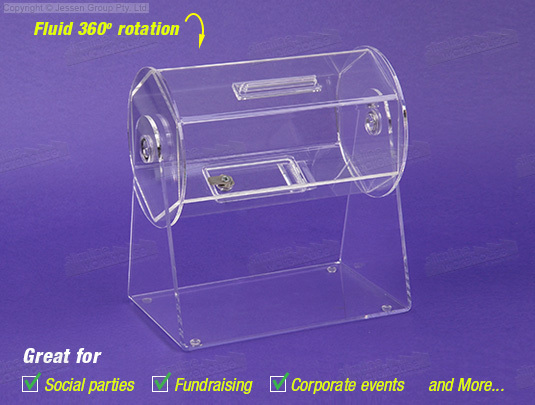 The raffle barrel for sale is made from 5mm clear acrylic, offering a durable unit that is available at a lot price. Using a clear drum helps assure participants that the drawing isn't rigged, since they can see the container contents at all times. The raffle barrel features a stand, also made from clear acrylic, to keep the display upright during use. This competition box is also lockable, preventing items to be taken out by people who don't have access with the included key. To place entry forms inside, a small slit is on the side for participants to place their tickets. The drum is able to be spun around once all entries are within to help randomise the selection for when picking out a winning entrant! A sliding bar acts to help keep entries inside from falling out during rotation.